Barbro Norberg sent to Maini her beautiful poem about the longing after her Dad that passed away, and asked Maini to compose it. It suits well to release this single before November 3rd when people in Sweden celebrate All Saints’ Day, and remember relatives and friends that have passed away. Music is written by Maini Sorri and the label is Reya music from Sweden. Maini Sorri’s You Are On My Mind single released on October 26th 2018. Bring Me Home is an album comprising of 6 songs from rock and dance genres featuring a brand new song titled Bring Me Home based on a true story that Maini told Gary Cornman, the lyricist of every song on the album. He surprised Maini by writing a poem about her adventure that Maini then composed as the title track of the album. The Bring Me Home album also features 5 songs that were previously released as singles including Parting Of Our Way, I Fall To Pieces, Lost Love, Never Said Goodbye and Lost Love (Dance Remix). Bring Me Home released on September 20th 2018. Maini Sorri and American rapper Magneto Dayo have returned to collaborate on an entire album comprising of 10 songs that fuses their respective genres of pop, hiphop and rock together. The album features all-new songs including Long Live the King and When Two Worlds Meet complimented by remixes of songs such as Oh Echo, Please Go Away and Shiny Eyes that are individually by Magneto Dayo and Maini Sorri through introducing each musician into one another’s songs; hence the title When Two Worlds Meet, alongside the inclusion of their two previous singles Blue Song and Second Chance. There are also two solo tracks including Museum of Bass by Magneto Dayo and Lost Love by Maini Sorri on When Two Worlds Meet that released on May 23rd 2018. As an annual tradition; Melodic Revolution Records releases Spirit of December to promote seasonal spirit and good will from one person to another through the positive power of music and has been rather poetically released on Thanksgiving Day. You can stream the entirety of the 14 track album for free from November 23rd 2017 until the end of January 2018. You can stream the Spirit of December 7: Songs of Peace, Love and Hope compilation album by clicking on the front cover or the link below. Maini Sorri’s song Lost Love is featured amongst the incredible 50 song soundtrack in the stunning videogame The Metronomicon which has received a home console port titled The Metronomicon: Slay the Dance Floor; an imaginative mixture of dance rhythm, action and RPG genres developed by Puuba Games and published by Akupara Games which released digitally for PS4 and Xbox One on August 29th and 30th 2017. Parting Of Our Way is a rock single, complimented by an instrumental version of the rock arrangement of the song. Parting Of Our Way received a worldwide release on January 23rd 2017, courtesy of Reya music located in Sweden. You can order your digital copy of the Parting Of Our Way single by clicking on the front cover or the link below. Maini Sorri’s song Lost Love is featured amongst the incredible 50 song soundtrack in the stunning videogame The Metronomicon; an imaginative mixture of dance rhythm, action and role playing game genres developed by Puuba Games and published by Kasedo Games which officially released digitally via Steam for PC and Mac on September 29th 2016. You can order your digital copy of The Metronomicon videogame by clicking on the front cover or the link below. Maini Sorri’s song Lost Love is featured on the official soundtrack album for the stunning videogame The Metronomicon; an imaginative mixture of dance rhythm, action and role playing game genres developed by Puuba Games and published by Kasedo Games. The official soundtrack album officially released digitally via Steam on September 29th 2016. You can order your digital copy of The Metronomicon official soundtrack album by clicking on the front cover or the link below. I Fall To Pieces is a rock single, complimented by an instrumental version of the song. I Fall To Pieces received a worldwide release on May 31st 2016, courtesy of Reya music located in Sweden. You can order your digital copy of the I Fall To Pieces single by clicking on the front cover or the link below. Second Chance provided the second collaboration between Maini Sorri and rapper Magneto Dayo, complimented by an instrumental version of the song. Second Chance received a worldwide release on January 25th 2016, courtesy of Reya music located in Sweden. You can order your digital copy of the Second Chance single by clicking on the front cover or the link below. Never Said Goodbye is a hard rock single, complimented by an instrumental version of the song. Never Said Goodbye received a worldwide release on October 26th 2015, courtesy of Reya music located in Sweden. You can order your digital copy of the Never Said Goodbye single by clicking on the front cover or the link below. Lost Love is a rock single, complimented by an instrumental version of the rock arrangement of the song. Lost Love received a worldwide release on June 15th 2015, courtesy of Reya music located in Sweden. You can order your digital copy of the Lost Love single by clicking on the front cover or the link below. Lost Love also has a Dance Remix single that provides a dancier vibe to the arrangement of the rock song, complimented by an instrumental version of the Dance Remix. Lost Love (Dance Remix) received a worldwide release on June 15th 2015, courtesy of Reya music located in Sweden. You can order your digital copy of the Lost Love (Dance Remix) single by clicking on the front cover or the link below. A re-release of Maini Sorri’s cover version of the classic Christmas carol Silent Night that was originally composed by Franz Xaver Gruber and Joseph Mohr in 1818 when it received a debut performance at the St. Nicholas Parish Church in Austria on Christmas Eve; provided Maini’s third Christmas song. Silent Night received a worldwide re-release on December 10th 2014, courtesy of Reya music located in Sweden. You can order your digital copy of the Silent Night single by clicking on the front cover or the link below. Awoken Heartbroken (Remixes) is an EP containing Rock Remix and a Metal Remix, alongside an instrumental version of both remixes of the original song. Awoken Heartbroken (Remixes) received a worldwide release on December 14th 2014, courtesy of Reya music located in Sweden. You can order your digital copy of the Awoken Heartbroken (Remixes) EP by clicking on the front cover or the link below. Awoken Heartbroken is a pop single, complimented by an instrumental version of the song. Awoken Heartbroken received a worldwide release on November 4th 2014, courtesy of Reya music located in Sweden. You can order your digital copy of the Awoken Heartbroken single by clicking on the front cover or the link below. Blue Song provided the debut collaboration between Maini Sorri and rapper Magneto Dayo, complimented by an instrumental version of the song. Blue Song received a worldwide release on June 9th 2014, courtesy of Reya music located in Sweden. You can order your digital copy of the Blue Song single by clicking on the front cover or the link below. Moira is a pop song inspired by a young devoted fan of Maini, named Moira who became a fan of Maini when she sang at Swedish radio Sisuradio’s Song contest in Sweden. Moira received a worldwide release on March 4th 2014, courtesy of Reya music located in Sweden. You can order your digital copy of the Moira single by clicking on the front cover or the link below. Maini Sorri’s cover version of the classic Christmas carol Silent Night that was originally composed by Franz Xaver Gruber and Joseph Mohr in 1818 when it received a debut performance at the St. Nicholas Parish Church in Austria on Christmas Eve; provided Maini’s third Christmas song. Silent Night received a worldwide release on December 19th 2013, courtesy of Reya music located in Sweden. You can order your digital copy of the Silent Night single by clicking on the front cover or the link below. Just A Dream (Remixes) is an EP containing six different mixes of the same song. For instance, Just A Dream (Trilogy Dreamix) is a faster, more electronic version than Just A Dream (Radio Edit) that takes inspiration from 70’s disco. Just A Dream (Remixes) received a worldwide release on November 11th 2013, courtesy of Reya music located in Sweden. You can order your digital copy of the Just A Dream (Remixes) EP by clicking on the front cover or the link below. Hold Me is a dance single, complimented by an instrumental version of the song. Hold Me received a worldwide release on May 7th 2013, courtesy of Reya music located in Sweden. You can order your digital copy of the Hold Me single by clicking on the front cover or the link below. Please Go Away is a dance techno single, complimented by an instrumental version of the dance techno arrangement of the song. Please Go Away received a worldwide release on November 13th 2012, courtesy of Reya music located in Sweden. You can order your digital copy of the Please Go Away single by clicking on the front cover or the link below. Please Go Away also has a Rock Remix single that provides a rockier edge to the arrangement of the song, complimented by an instrumental version of the Rock Remix. Please Go Away (Rock Remix) received a worldwide release on November 13th 2012, courtesy of Reya music located in Sweden. You can order your digital copy of the Please Go Away (Rock Remix) single by clicking on the front cover or the link below. Shiny Eyes seen Maini return to the electronica, techno and dance genres of Let Me Do Your Time with just as much success as it was the 4th most added track on the CMJ Chart of all releases throughout the US in May 2012. Shiny Eyes received a Swedish release on May 2nd 2012 followed by a US release on May 7th 2012, courtesy of Reya music located in Sweden. You can order your digital copy of the Shiny Eyes single by clicking on the front cover or the link below. Someday Vol. 2 is a perfect combination of the entire Someday and Dreamworld EPs with a re-positioned track order to make the ten songs flow in harmony as one album. Someday Vol. 2 received a Swedish release on November 7th 2011 followed by a UK release on November 14th 2011, courtesy of Reya music located in Sweden. You can order your digital copy of the Someday Vol. 2 album by clicking on the front cover or the link below. Dreamworld picks up where the Someday EP left off by providing a further five pop ballads including another of Maini Sorri’s most popular pop songs Dreamworld as the title track of the EP. Dreamworld received a worldwide release on October 31st 2011, courtesy of Reya music located in Sweden. You can order your digital copy of the Dreamworld EP by clicking on the front cover or the link below. Special Friend is the second single by Sorriso featuring the duet of Maini Sorri and the Italian artist John Baumann. Special Friend received a worldwide release on May 17th 2011, courtesy of Reya music located in Sweden. You can order your digital copy of the Special Friend single by clicking on the front cover or the link below. Let Me Do Your Time was a successful departure from Maini Sorri’s pop music as a detour into electronica, techno and dance genres with 66 weeks on the public vote based Music World Radio’s Alternative Top 20 Chart. Let Me Do Your Time remained for 9 weeks on Swedish radio station P3’s DigiListan show that presents the most sold tracks list. Let Me Do Your Time received a Swedish and UK release on February 28th 2011 followed by a US release on March 28th 2011, courtesy of Reya music located in Sweden. You can order your digital copy of the Let Me Do Your Time single by clicking on the front cover or the link below. Someday is one of Maini Sorri’s most popular and recognisable pop songs with 44 weeks on the public vote based Music World Radio’s Alternative Top 20 Chart and is the title track of this EP featuring five pop ballads. Someday received a Swedish release on March 1st 2010 followed by a UK and US release on September 13th 2010, courtesy of Reya music located in Sweden. You can order your digital copy of the Someday EP by clicking on the front cover or the link below. Hiding Place is the debut single by Sorriso featuring the duet of Maini Sorri and the Italian artist John Baumann. Hiding Place received a worldwide release on January 13th 2010, courtesy of Reya music located in Sweden. You can order your digital copy of the Hiding Place single by clicking on the front cover or the link below. 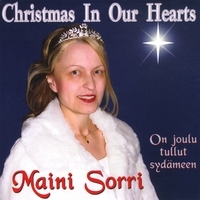 Four beautiful and melodious Christmas pop songs, two in English and two in Finnish, sang by the clear and beautiful voice of Maini Sorri with touching lyrics beautifully arranged with Nordic melancholy sound and Christmas spirit. Christmas In Our Hearts received a Swedish release in December 2006 followed by a UK release on November 29th 2010, courtesy of Pr.O.N located in Sweden. You can order your digital copy of the Christmas In Our Hearts EP by clicking on the front cover or the link below. 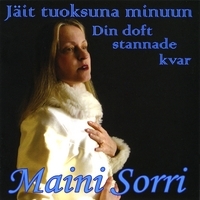 14 beautiful and melodious singer songwriter tracks in Finnish and Swedish, sang by the clear and beautiful voice of Maini Sorri accompanied by professional Finnish and Swedish pop and jazz musicians. Jäit tuoksuna minuun – Din doft stannade kvar received a Swedish release on March 11th 2006, courtesy of Pr.O.N located in Sweden. You can order your digital copy of the Jäit tuoksuna minuun – Din doft stannade kvar album by clicking on the front cover or the link below. Acoustika Vol. 27 features Dreamworld by Maini Sorri. Acoustika Vol. 27 received a worldwide release on October 18th 2011, courtesy of 272 Records located in California, USA. You can order your physical CD copy of the Acoustika Vol. 27 compilation album by clicking on the front cover or the link below. Acoustika Vol. 26 features Like An Angel and I Shouldn’t Have Trusted You by Maini Sorri. Acoustika Vol. 26 received a worldwide release on August 12th 2011, courtesy of 272 Records located in California, USA. You can order your physical CD copy of the Acoustika Vol. 26 compilation album by clicking on the front cover or the link below. Shine On 2 features Like An Angel by Maini Sorri. Shine On 2 received a worldwide release in 2008, courtesy of Mister Suede Records located in Sweden. You can order your physical CD copy of the Shine On 2 compilation album by clicking on the front cover or the link below.